No matter your politics, your stance on Obamacare, or if Aaron Sorkin’s biting appraisal of society circling Facebook last week struck a chord, if there’s ever a time to be unabashedly proud to be an American, this is the week! The beauty of our great country is that we can hold our own values and beliefs and simultaneously open our arms to give our neighbor a big hug. Marketers, too, get a bad rap sometimes. As the sunny optimism of the Fourth is upon us, take a moment to remember all the reasons we can be proud to fly the flag of a marketer. Commerce is as American as apple pie, after all. 1. We help people discover things that make their lives better. 2. We’re cross discipline. We get to be psychologists, products guys and finance guys all rolled into one. 3. We understand people, what they want and need and their motivations. Of all society’s professions, we’re among the most empathetic. 4. We’re first to get our hands on new tech toys and sites since we’re early adopters. 5. We have a job. Simple, but not to be overlooked! 6. We’re responsible for some of the most famous iconography in history; we sometimes make art. 7. We’re Mad Men. Don Draper is our homeboy. 8. We’ve championed justice and patriotism at critical periods of history. We’ve reminded our countrymen to keep calm and carry on. We gave voice to Rosie the Riveter. 9. We help legit business rank ahead of black hats and spammers, making the SERPs better for everyone. 10. We help small business succeed and make people’s dreams a reality. What are your reasons for being a proud American marketer? Here’s to safe and laughter-filled get together with friends and family this week! SEOShirts Makes Me A Proud Bruce Claymate! These points can be applied to a marketer of any nationality, with point 8 having different examples. 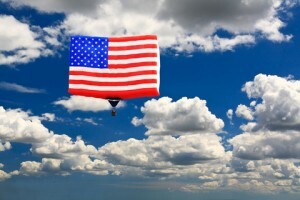 What really differentiates an American marketer?